Submitted by jan.svec on 26. August 2008 - 9:35. 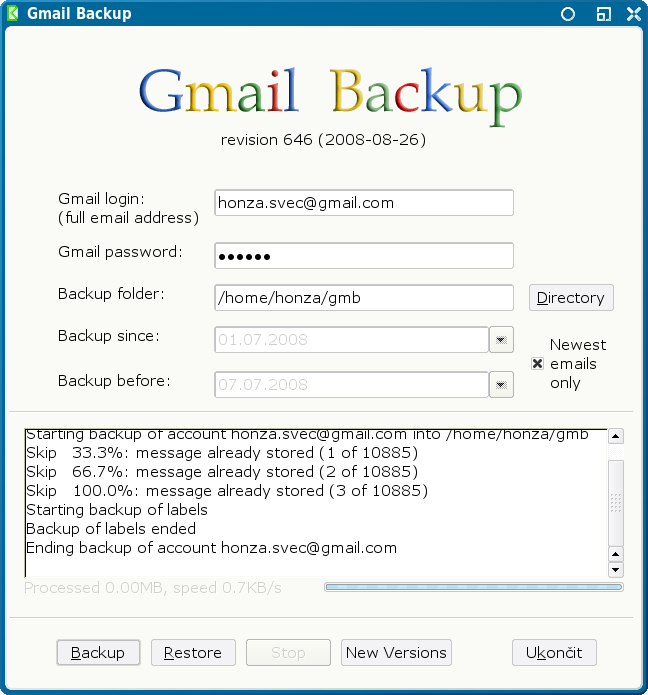 This is the fifth pre-final release of the GMail Backup tool - the ultimate one-click solution for doing backups of your GMail account. This version fixes errors reported in _unicodeHeader() [1, 2, 3]. The program also doesn't insist on creating the current.eml file . We also removed the 40 day period, described here: . The application also doesn't connect "home" every time it runs the backup or restore to check new versions. The GUI version contains the button "New Versions" for checking for new versions of GMail Backup and the command line tool has the "version" command . In this version, we also improved support for Windows Vista [7, 8]. It is recommended to upgrade. #1Submitted by Contrawa (not verified) on 31. August 2008 - 9:21. An OSX version of Gmail-Backup would be very useful. Meanwhile, we will try the Windows version on a Vista64 system. #2Submitted by iosonofabio (not verified) on 3. October 2008 - 13:44. Thanks for the hard job, I will test the program in the next days. #3Submitted by Anonymous on 28. January 2010 - 13:19. Hey that's really a unique tool but how can i able to download this tool and i am unable to understand the settings that are required for this tool. #4Submitted by Anonymous on 8. February 2010 - 6:14. The GUI version contains the button New Versions for checking for new versions of gMail Backup.It also has better support for Windows Vista and its getting better.